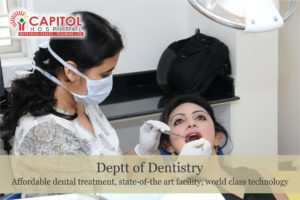 Primarily, we at Capitol, being the best in the region when it comes to Dental care. With chic technology and finest dental staff, we practice almost painless procedure for precise outcome. Our specialist in smile designing, laser dentistry and sedation dentistry are determined to restore confident smile and to offset pain from dental procedures. This field deals with diagnosis, prevention and minimally-invasive treatment of decay. Conservative correction of esthetic problems with dental bonding. Investigation of clinical, radio-graphic and microscopic features of oral / maxillofacial diseases and abnormalities. Pediatric DentistryOral health care for infants, children, and adolescents, including persons with special health care needs. Preventive & Community DentistryImprovement of the public’s oral health through prevention and control of oral diseases. Grafting, dental implant placement and other surgical treatments of conditions, injuries, and esthetics of the teeth, jaws, and face. This field relates to the treatment of the supporting dental structures, including gums and alveolar bone and their replacements by grafting or implants. Complete oral rehabilitation, including the use of dentures, crowns, bridges, veneers, & implants.